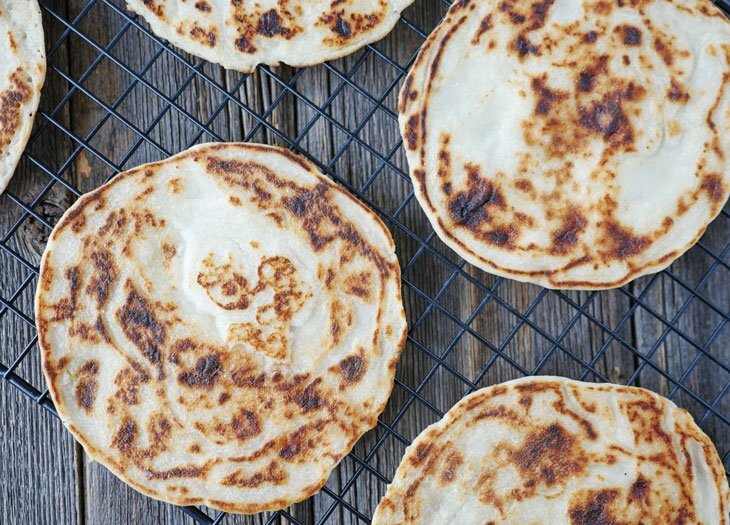 This coconut flour naan is so easy to make and calls for just three ingredients! It’s a multi-purpose flatbread that you can use as a tortilla, wrap, crepe, sandwich bread – you name it. My recipe is paleo, gluten free, grain free, dairy free AND nut free. 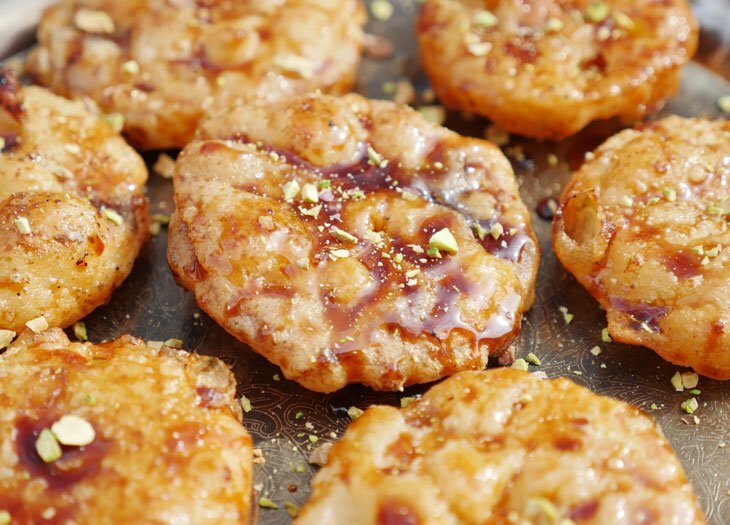 This tastes just as good as my famous paleo naan. I’m sure you’ve all heard or hopefully tried my 3 ingredient naan recipe by now. It went viral years ago and is still one of my most popular recipes. Well ladies and gents, there is a new naan in town and this naan is made with coconut flour! Believe it or not but I actually like this coconut flour naan even more than my popular almond flour naan – it surprisingly tastes the same and is super easy to make. It’s also really affordable since it calls for coconut flour rather than almond flour. Coconut flour is great because it’s high in fiber, protein and healthy fat. I know coconut flour has a reputation for being “dry” in bread or baked goods but that’s not the case at all in this naan recipe. If you’ve ever tried my paleo naan before then you can expect very similar results when using this recipe. Trust me – it tastes good. I make a lot of this coconut flour naan and always freeze extra naans. They thaw perfectly. What am I missing?! Leave me a comment and I’ll add it to this list! So technically this naan isn’t really new. Those of you with my paleo Indian ebook are already familiar with the recipe. Tomorrow (June 9, 2018) marks the 3 year anniversary of my ebook, South Asian Persuasion, and this recipe is in my “basics” chapter. I wanted to share it on the blog with you as a thank you. It’s hard for me to believe I wrote my SAP ebook three years ago. Over the years many have asked why I wrote this as an ebook and not as a paperback. The truth is that my concept was rejected by publisher after publisher – no one thought my idea would “sell well.” I knew they were wrong because so many of you had asked for this type of book so I decided to self publish. I spent countless hours working away to create the perfect paleo Indian ebook with recipes for things I wasn’t even initially sure I could paleo-fy: naan, roti, gulab jamun, jalebi, rasmalai, pakoras, chaat, samosas etc. You name a popular Indian recipe and chances are, it’s in my ebook. You all helped make my eBook a success and made my time worth it. I really can’t thank you enough. I hope you love this new “paleo naan” 😉 I think you’ll like it even better than my old paleo naan. Those of you with my ebook or those who try both, would love for you to leave a comment letting us know which naan you prefer! I really want to know and I’m sure others do too! 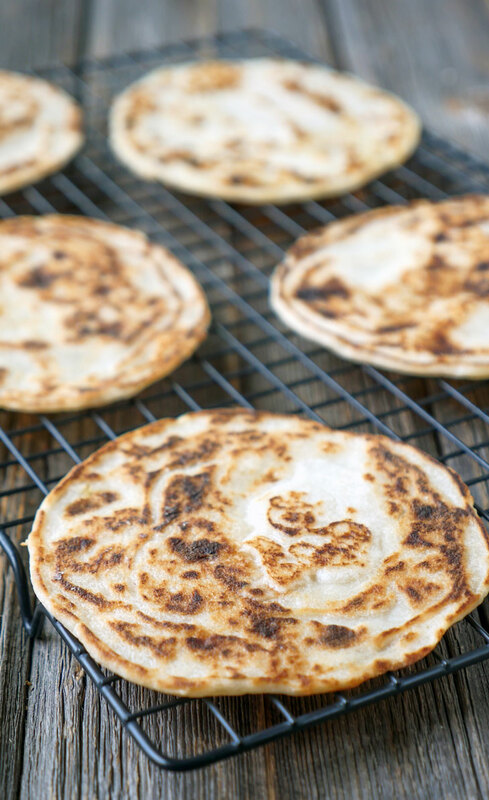 I came up with this recipe after getting many requests from blog readers asking me to make my paleo naan with coconut flour instead of almond flour. This nut free recipe is very similar to my paleo naan – in fact, I think I like this one better! Pre–heat a 9.5 inch (or larger) nonstick pan or using this steel crepe pan over medium heat. Mix all the ingredients together in a bowl, and pour ¼ cup of batter onto the pan. Spread the batter out with a spoon. After 2–3 minutes, or once the batter fluffs up and looks firm/mostly cooked, flip it over to cook the other side (be patient, this takes time. If you are worried about the outside burning, just lower the heat). Serve immediately or cool the bread on a wire rack to maintain crispiness. If the middle still seems slightly undercooked, place the flatbread on a baking sheet and bake at 350°F for 10-15 minutes, or until done. The FDA lists coconut as a tree nut but it’s actually a seed and most people who are allergic to tree nuts can safely eat coconuts however if you are allergic to tree nuts I have to tell you to talk to your doctor before adding coconut to your diet. Hi Ashley! Can we use arrowroot flour instead of tapioca flour? Looking forward to trying this recipe! Hi Maneesha! Yes, you can! I will include that in the recipe – thank you for asking! Heads up that some coconut flours need more water than others. I’m in Australia, I needed to add another 1/2 cup of water to thin this down enough to work. It still worked awesome! But needed that extra water. Linda, oh wow that’s good to know thanks for that! I have only tried this using coconut flour from the US (though I have tried many different brands). I wonder what’s different about the coconut flour in Australia? Can I use tapioca starch instead of flour? Same thing as I understand it. Hi. Can you describe what kind of consistency we’re looking for in the batter? As others have pointed out, coconut flour varies quiet a bit. Thanks! Hi Carlos, it should be like pancake batter 🙂 Let me know what you think if you try it! Amazing. Simply amazing. I really enjoyed this coconut flour naan! A beautiful dairy free and grain free alternative to regular naan! It paired so well with your avial recipe! LOVE! Will the recipe work with soy milk? I haven’t tried it with soy milk but I think the fat content in the coconut milk is important so my guess would be no. If you try it though let us know! These were absolutely delicious, and definitely a remake in my house. My 1 year old also loved them, a great healthy treat for him. I used arrowroot flour and coconut flour, no problems cooking the recipe, I going it very easy. Donna, so happy to hear that you and your 1 year old liked these so much! Love, love your recipes!! I’ve changed over to a mostly gluten free and dairy free diet over the past 2 years and this recipe seems like it would solve all of my paratha/naan/roti/chapatti problems. However, I try to avoid using canned products for something i want to use regularly (couple tomes a week)- I’m fine with it for the one off baking etc but if i wanted to try to incorporate this into our weekly meals- do you think using a fat like ghee and a liquid would work instead of the canned coconut milk? Or any other suggestions for full fat coconut milk that are not canned? Chandni, so happy to hear that you like my recipes! There’s boxed coconut milk that you can try? The ghee with another dairy-free liquid might work but I haven’t tried it myself so I can’t say for sure. Hopefully another reader will see this and be able to suggest something. Chandni, wow that is awesome! I will have to try this – thanks for sharing! I’d love to try this recipe but I’m confused about the tapioca flour. I can only buy tapioca starch or cassava flour. Which one should I use? Hi! Is the carb count listed for the full recipe or per flatbread? I’m on keto and wondering if this is keto approved? Hi Sarah, it is listed per flatbread – hope that helps! Love your recipes, they are so delicious! I have been looking for a keto flat bread recipe and I wonder if you have any? Or have stumbled on any good one. My husband needs to go really low carb to control his blood sugar, but his pitas are not negociable 🙁 – I must find a substitute flat bread that is really good in taste and texture. Do you have a recipe to make up an all purpose flour using coconut flour and white rice flour but no cassava/tapioca, brown rice flour, nut flours, eggs or milk? 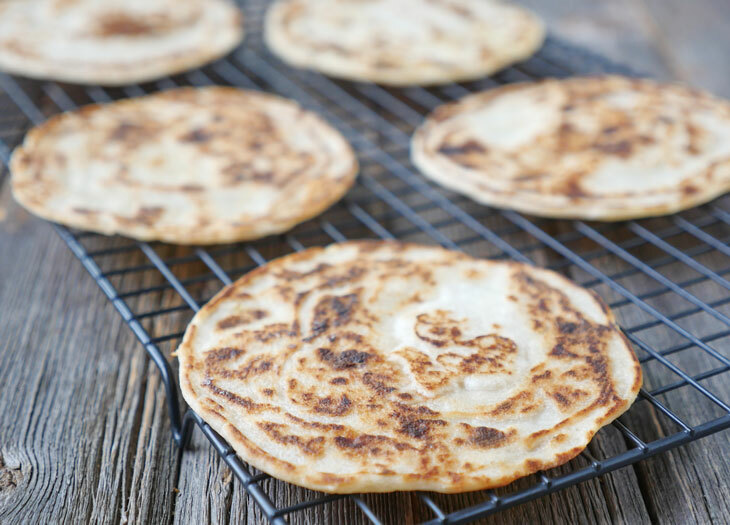 Hi Patti, I don’t have a recipe for all purpose flour on my blog but I do have a really simple rice flour flatbread recipe that you’d only need one type of flour in order to make if that might be helpful? 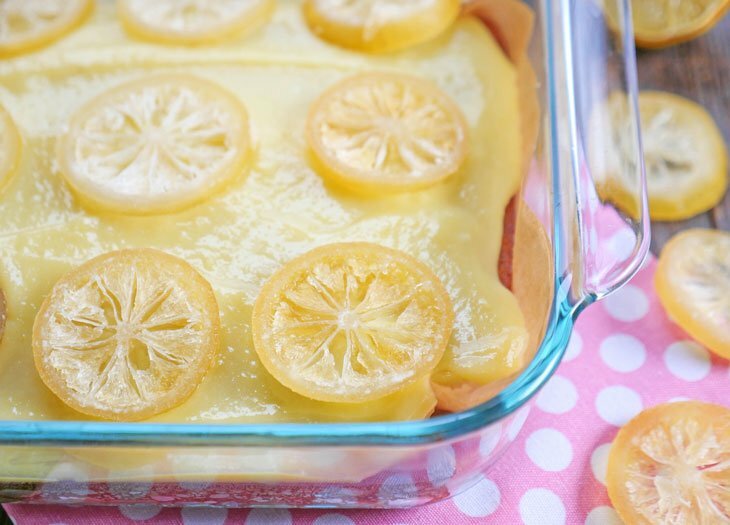 Delicious and easy recipe! Appreciate you sharing it with the world. I was grateful to have come across this pin on pinterest. How do you freeze them? Do you separate with wax paper? Do you freeze in a ziploc bag? I just made this recipe for the first time. It was delicious. I have been gluten and grain free for two months now and I have been actually going crazy just eating meat and veggies. I missed something delish to go with my home cooking. Thank you! OMG, so good! I just made this and ate it like a pancake topped with butter, lemon juice and maple syrup. It was amazing. Thankyou, I’ve been trying to find a versatile recipe like this that also tastes great. Do you really mean 1 tsp salt? They are super salty! Mine are extremely salty, too, and I truthfully am known for my love of salt. I used finely ground Celtic salt. I will cut it in half or less next time. I know I will love these with that one adjustment. Also, I needed the nonstick for this. These stuck to my blue steel French crepe pan. Thanks for the recipe! It’s not dry at all. im looking for an easy recipe for making lunch pizzas. want to freeze for quick access. will this work? fyi i like to heat them in a covered iron pan. Hi Cassandra – if you want to use these as pizza crusts, you can bake them for a bit to help them firm up/crisp up. That way they will hold up better once you add sauce and cheese. can they be freezed half cooked? Yup definitely. You can also cook them fully then just warm them in the oven to reheat them. I made this tonight as side just for myself (as my husband and son were eating a side I couldn’t eat). Well they both wanted to try it and they both loved it, so I had to fight them off so I could have some with my dinner. After you gave frozen them, how do you reheat them? Thanks! Hm. Mine came out more like a crepe then a bread. I can’t see cutting and using this like naan. Any suggestions?? Thank you so much for your hard work in posting recipes which are of great help to those of us with health issues. Can you tell me if the naan bread can be frozen or, if it can be refrigerated only, how long can it remain in the refrigerator? Thanks Marie! Yes, you can freeze this bread 🙂 I suggest laying them out on a pan, freezing them, then putting them into a ziplock/freezer bag – this way they won’t stick to each other. I’d keep them in the fridge for 4-5 days then after that I’d freeze them – or you can freeze whatever you don’t plan to eat right away. I hope that helps! This coconut naan seems interesting and unique to me as I never heard of coconut naan before. 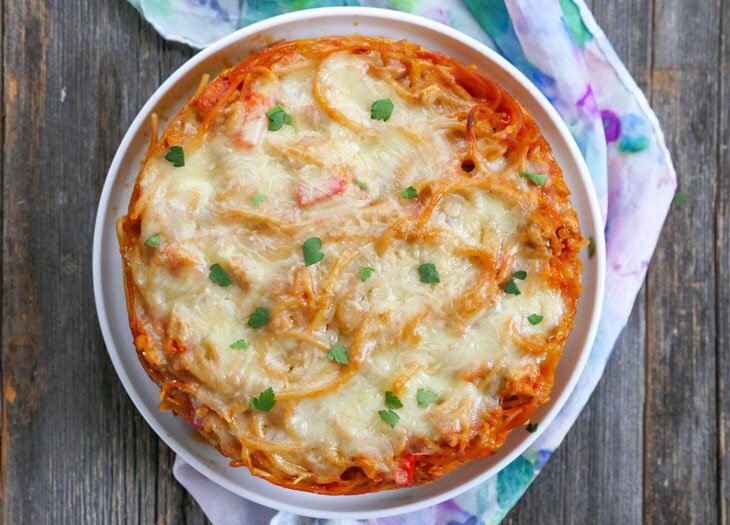 I have quite started liking your recipe blogs as they are quite different. Hi Sonia, I haven’t tried this with cassava flour – so I can’t say. I actually recently bought some but have yet to play around with it! Let us know how it goes if you give it a try! This was DELICIOUS! I ended up using the exact dry ingredients, but needed to double the coconut milk to get the pancake batter consistency. I added a few additional spices – ground garlic and fresh cilantro, cooked it in butter… and it tasted better than my favorite local Indian restaurant. I’m so glad you liked it! Thanks for letting me know how it turned out for you 🙂 Can I ask what brand of coconut milk you were using? I haven’t had to double it before so just curious! Hi! Can I use almond flour instead of cassava/tapioca flour? Can I use almond milk instead of coconut milk? I struggle to find a good clean coconut milk with no nasties where I live. I haven’t tried it this way but I believe the fat from the coconut milk helps hold it together – if you try almond please let me know how it goes! I just cooked them, but they are very oilie and thin. I also baked them after for 10 minuets, but it didn’t help. What did I do wrong? I followed your recipe. I made half the recipe, just in case, and it came out perfectly – light and fluffy and perfect as a wrap. I’m not gluten-free, but someone gave me a bag of coconut flour and this turned out to be a great way to use some of it. Awesome recipe! Can’t wait to try it. Was wondering if I can substitute the tapioca flour with Almond flour instead? Attempted to make these yesterday and my wife and I found them to be far too sweet and, well, “coconutty” to be used as a tortilla or sandwich wrap. As a crepe I bet they would be delicious, however. Maybe try my original paleo naan made with almond flour? How do you care for the pan you recommend? Looks like one seasons it and never wash it but just clean it off with a paper towel. Is that right? I usually just rinse it, wipe it and then heat it over the stove or put it in the oven if the oven is hot. If it gets really dirty I do wash it but I typically don’t cook anything on it other than flatbreads/bread. This looks awesome. My gf and I are trying an AIP diet. Would this naan be suitable for that? Do you have AIP indian recipes we can follow? I was afraid they would fall apart and wouldn’t hold up to my saag sauce but I was wrong! These are so good, thank you! Sunny, I’m so happy to hear that 🙂 And yes, these are surprisingly sturdy! Hi, I was wondering if there was any way to make this recipe without the arrowroot flour or tapioca starch? I’m on the keto diet so that’s a bit more carbs than what I need. Have you tried with a combination of almond and coconut flours and psyllium husk? Pamela, I’m glad it worked out for you – that’s great that you’re able to make them right in the oven! Just wanted to say thanks. I’m about to start the AIP diet and it’s so nice to know I’ll have a delicious, easy, reliable, freezable bread recipe. I loved the almond flour naan and thought I’d have to say goodbye to it when I started AIP. Then I saw the link to this recipe! YEEESSSS!!!! A new diet is intimidating but having some tasty bread to wrap around weird new foods will make them way easier to get used to! PS kudos on handling the comments section with such grace. I have been searching for a bread recipe that doesn’t taste like eggs. This one is the best! The outside is crispy and the flavor is savory. I added sage for using with your chicken pot pie. I do need help, though, with cooking with coconut flour. It always turns out rubbery and looks raw. I did bake it in the oven for 15 minutes after a generous time in the pan, but that just made the inside more rubbery. Any ideas? Is it supposed to pull apart like play dough? Hi Nancy! I’m glad you like this! And no it definitely should not pull apart like play dough – my guess is, when you’re measuring the coconut flour are you packing it in? It sounds like there may be too much of it. Try using the dip and scoop method – that’ll give you the right amount and it should turn out lighter. Please let me know if this is the issue and if my suggestion fixes it! I’m so surprised and disappointed by how bad these were. I used table salt and they were way too salty. They did crisp up nicely, but the inside seemed undone so I kept cooking. The inside still didn’t seemed a little gooey. So, for the second try I thinned out the batter a little with water to make more like pancake batter and cooked in a pan until nicely brown. Then put in the oven for 10 minutes. At this point the inside was cooked, but it was more of a cooked gel texture than bread. What did I do wrong?Do you think arrowroot could be the problem? Adding water? Fabulous!! Finally some bread to have with my soup. It was so quick and delicious without even putting anything on it. I can’t thank you enough.